Whether you business has been around for 50 years or is a new start up, a summer corporate picnic is a great way to show your employees appreciation at a different time of year than the December holiday season. 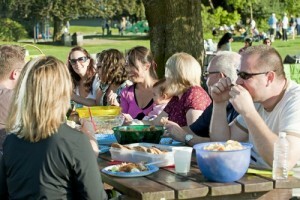 Here are some tips, ideas and suggestions to make your company picnic a success! Give your employees, friends and other invites ample notice as to when your company picnic will be. People take a lot of their vacation time during these months and may feel left out if you schedule your company picnic when you know that they are going to be away. Also, you wouldn’t want to run an event where no one shows up. The more the merrier. Also consider you schedules and their families. You won’t be able to please everyone, but giving ample notice and making consideration will lend to better turnout. If you followed tip #1, you would have told people far in advanced about your upcoming family company event. As most are unlikely to mark this sort of thing in their calendars, it would be wise to remind them when closer to the event date. It’s up to you how you want to do this. It may be easiest to use your email marketing software to schedule reminders to your employee and company list. 1 month, 2 week and 2 day reminders are great options to consider. Part 1: Knowing who is coming to your event is 100% necessary for proper planning. Of course your employees will be there, but ask yourself these questions. Is this open to their partners and/or family? Am I setting a limit to the number of guests? Do I want to open this up to loyal customers and their families? How big/manageable do I want this to be? 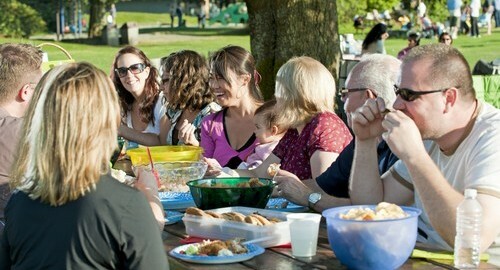 With those questions in mind you will be on the right track to planning your company picnic. Part 1: Consider using an event invitation system such as Eventbrite or Eventjoy to manage your event and send it out via email. DO NOT USE FACEBOOK as your primary event management system. People often ignore their Facebook event requests and you won’t get a good turnout. You may use Facebook to give updates on the event such as entertainment, discuss topics such as potluck items etc. Depending on the size of your company and how many people are coming, you may need a company picnic committee to organize it. Consider getting one member from every department to assist, but keep it to a maximum of 4-6 people as you don’t want there to be too many hands in it and if they are organizing on company time, it would cost less with a smaller team. Have your committee choose a location off your property that has easy access, ample parking and proper accessibility. The last thing you want employees thinking of is work at this time. It is a picnic after all! You have several options. 1)Cater your picnic– This is the best option for larger organizations where you don’t want to deal directly with having to organize the details of food such as prep, serving, clean up. 2) Book a food truck– These are all the rave these days and are great for outdoor events. Food trucks can either be catered or if you are on a budget have them sell their food on site. 3) Master Chef– Find someone or someones on your staff who are great at and love cooking for people. Of course you don’t want them to feel like it’s a work day, so keep this option for a small to mid sized organizations. Also, don’t forget to show your appreciation for helping out by giving them a special gift at the end of it all. 4) Potluck– The perfect option for a smaller business. Often done at Holiday Parties as with a smaller group this can be managed by that infamous Facebook group. Snacks… as always, providing picnic food such as cotton candy, popcorn machines and snow cones is a staple to your event. If you are running a sports tournament or company movie night, having these essentials are key. Note: Make sure to cater for all dietary concerns. Food goes hand in hand with the fun. Make sure to know your audience and have the appropriate activities for the different age demographics. Making your company picnic into a softball game? Try having a kids sports zone. Or try an obstacle course tournament where individuals and teams for best time and prizes. It’s a great way to build team spirit and have a blast. Everyone is impressed by magic. Get an entertainer or impress with movie magic on an outdoor movie screen. This is an often overlook aspect to company picnics and just like your workplace, safety should always be first. Have a first aid kit on site. Delegate someone who has first aid training as day’s safety officer. Have an emergency plan. It can be as simple as call 911. Rent from Insured inflatable companies that meet TSSA requirements. For outdoor events in summer, make sure to provide a hydration station, shaded areas via tent rentals and even providing sunblock. In case of weather, have a back up plan to re-schedule or re-locate. If you have your event at a city park, there may be an arena nearby where you can move your activities into. Research these alternatives when looking into your event location. If you have rented tents, they can provide you the shelter you need from rain and intense sun. What is a picnic unless you have memories to go along with them? Make sure to capture these memories with a dedicated photographer. Preferably someone with experience in event coverage. As it isn’t always fair to have someone behind a camera all day and miss out on being in the pictures themselves. Hire a photographer. We recommend this event photographer.